The 200-1390-65 WindObserver 65 is a precision, solid-state ultrasonic anemometer providing wind speed and direction data. 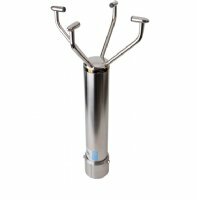 The 200-1390-65 WindObserver 65 is a precision, solid-state ultrasonic anemometer providing wind speed and direction data via 1 digital and 3 optional analogue outputs and features an IP66 rated stainless steel housing, which is particularly suitable for use in saltwater environments. This anemometer has an optional de-icing system enabling the sensor to operate effectively in environmental conditions experienced at high altitude or at sea and is recommended for use in aviation, marine and offshore applications. Customer selectable vector rolling average and 3 second gust in accordance with WMO - No. 8 Seventh Edition 2008 ISBN 978-92-63-10008-5. Site Calibration: None required. Integrity check unit (Zero wind) supplied as optional extra.